Reconstruction of extinct ancestral genomes is an important topic in comparative genomics and has a wide range of applications. By comparing a current-day species against its ancestor, we can deduce how it differs from the ancestor and infer detailed information about the evolution of species. With more and more fully sequenced genomes becoming available, we are able to reconstruct ancestors at the whole genome level by using evolutionary events such as genome rearrangements, gene insertions, deletions and duplications. In this chapter, we will present the concepts related to whole genome evolution and ancestral reconstruction. 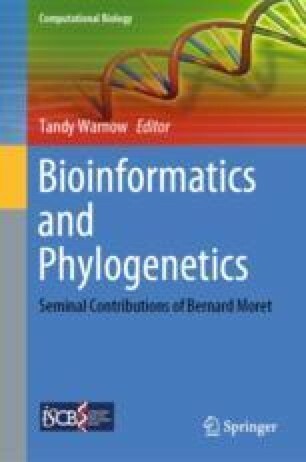 We will review evolutionary models and algorithms in pairwise comparison of genomes, computing of the median problem and optimizations in inferring phylogenies and ancestors from multiple genomes. JT was supported by the National Science Foundation of US (grant number IIS 1161586).